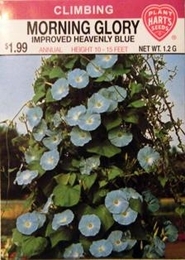 One of the few flowers of true blue and probably the finest of all Morning Glories. Flowers up to 4 inches across, deep blue with white throat. They blossom profusely for a long season, opening in the morning and facing the sun. Morning Glory seed has a very hard coat and better results will be obtained if the seed is soaked in lukewarm water for 24 to 48 hours before planting. Morning Glory prefer average soil, moderate watering. A southern exposure will add to more continuous blooming.